ALAS! Lady-detectives, Indian lady-detectives are elusive literary creatures. Despite the plethora of contemporary characters that the modern Indian writer has cajoled out of the mighty pen, this earthling has failed to evolve. But wait a minute. Here comes one waltzing in on her wannabe "black Fendi peep toes"—and six inches high no less! 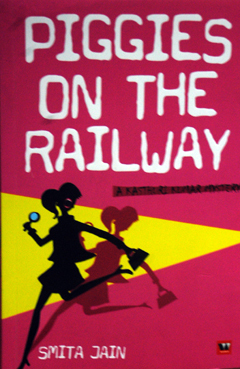 Enter Kasthuri Kumar aka Katie, detective with a buzz and two bumbling feet. And ‘seasoned’ chic-lit writer Smita Jain pulls her off with elan. Smita knows what she is getting into. Her successful debut novel ‘Kkrishnaa’s Konfessions’ is compounding into a screenplay for a Bollywood film and as she herself says: "I know I can write a decent murder mystery." Smita is also curious, "Did you guess who the killer is?" she asks fervently. And I must confess I did not. I was on the wrong railway track all along (much to this author’s delight!) and I certainly enjoyed the bumping ride! So apart from the mysteries the book holds (the title being one of them) what works is the plot. Ludicrous in parts, hilarious in others and mad-hatterish for good measure, the narrative is all over the place, literally. And Katie, the ditzy urban woman-detective with Mumbai as her base enables Smita to go back to a world she herself is familiar with, the film and television industry in Mumbai. With the maelstrom playing out in the midst of filmdom’s capricious leading ladies and men, ingratiating lackeys and power-broking filmmakers one cannot help but be drawn into a world that draws on characters we grew up watching, scenarios that have read as they played out in film magazines and actors we can identify or then can we? In all this is Katie and us. Katie who has had an eventful checkered career, one laced with embarrassing and hair-raising moments. Here she is armed with life’s trifling experiences, a fanciful libido and an earnest desire to solve murders, many murders, that is! And as she and a bevy of quirky characters comes tumbling in and out, you start to trace the journey that Smita has tracked on for her readers. Katie is hired by the ‘happening’ scion of Bollywood’s first family to find out just where the leading lady of his latest film has disappeared to and therein starts a riot act. The writing is breezy, racy. The language is colloquial and fun, irreverent too. While the book may be full of clich`E9s it works. Take a careful look around. This is how the yuppies speak. At least in Mumbai they do. The spoken word is nonchalantly insolent. Sample this: "Let’s just say that she once had a splendid hourglass figure. Obviously the sands of time had run it down—all to the bottom." This, describing someone Katie meets in the process of her sleuth-work. And its not just her characters, even the sub-plots are funny, eliciting that smile while you sit there unbelieving that someone could actually write all this down! I wish I could tell more but that would really give away the plot so ride along as the characters whiz by sporting their accents (which sometimes take a little working through) boyfriends and clothes and not necessarily in that order. You will feel the author’s relish as she takes on one preposterous situation after another playing out a rather cheeky plot. While it may not be anywhere close to a Miss Marple or even a Nancy Drew (and these comparisons are rather unfair but for lack of reference here they are), I do believe this book encompasses a contemporary urban setting, one familiar and welcoming. Kasthuri Kumar is all set to come back we are told at the back of the book. By then, you can be sure Smita would have ironed the edges out.